Halloween themed pumpkin design on cover and blue inside border. Each folder holds one vertical (portrait) 4x6 photo. 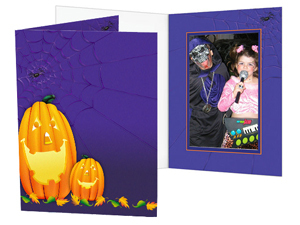 These Halloween Pumpkin Photo Folders are great to use for any Halloween photo event, including hayrides, school, office or haunted house themed parties, fall fairs and trips to a pumpkin farm or apple orchard.